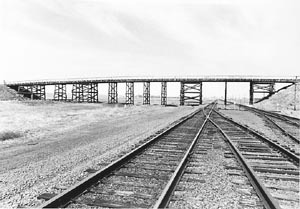 Designed by Nebraska's Bureau of Highways in June 1942, this timber trestle overpass provided wartime access to the Sioux Ordnance Plant. Just months earlier the American Association of State Highway Officials, in conjunction with the War Department, had developed a "Priorities Critical List", which specified materials deemed essential to the war effort. The Brownson Viaduct heeded this list. Other than steel fasteners and concrete abutment and pier pedestals, it was built entirely of wood, including a laminated wood deck. The 15-span structure was built that year by the Bushman Construction Company of St. Joseph, Missouri. "The defense activities and construction of Army and Navy ordnance plants, air bases, satellite airfields, and other defense plants brought about a decided change in the highway program for the past two years," the Bureau reported after the viaduct was completed. The Defense Highway Act of 1941 directed construction of access roads to defense plants, and the Priorities Critical List controlled the materials used to build them. The Brownson Viaduct reflected both of these national trends. Built of timber by a highway department that normally avoided timber construction, it is significant for its association with wartime transportation in Nebraska.